Smoothies tend to be both tasty and healthy, and the selection on Daily Blends are also all vegan and gluten-free, but should appeal even if you don’t have those requirements. The Daily Blends app has over 100 smoothie recipes, split into categories such as energizing, workout, dessert and kid-friendly, and you can also search based on the ingredients that you have to hand, or filter based on dietary requirements (such as nut free). When you find a recipe you can also tweak it to your liking, swiping across an ingredient that you don’t want to use to view an alternative. The Daily Blends app is enjoyable to use too, with big high-quality photos of all the smoothies and descriptions to accompany the recipes. 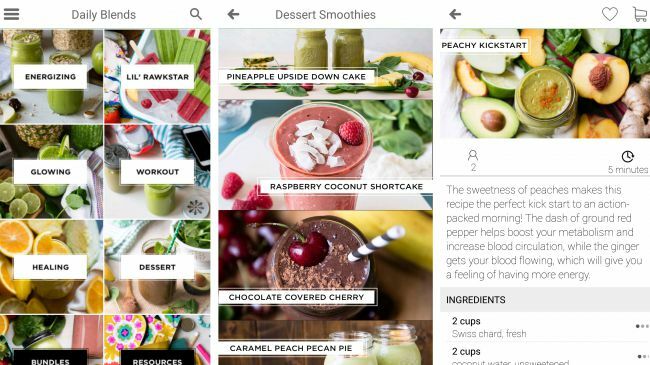 You can save favorites and add all the ingredients for a smoothie to an in-app shopping list with a tap, and the recipes are mostly quite quick and simple. For the purchase price you get all the smoothie recipes, but there are additional IAPs to unlock full meal plans if you want to go beyond smoothies.